“Girls” creator and star Lena Dunham said that she plans to focus on writing, directing and creating opportunities for women when her HBO series “Girls” ends at TheWrap’s Power Women Breakfast in New York on Thursday morning. TheWrap’s CEO and Editor-in-Chief Sharon Waxman took the stage to say that we’re in the mist of “a historic moment” in women’s history before introducing the “Girls” creator to the stage. “There is such a dearth of roles for women, I would like to be the person that brings more of those,” Dunham said, adding that hate for her “Girls” character is the result of a double standard among men and women characters. The Power Women Breakfast series brings together influential women of entertainment, media, technology and brands in key cities to network and connect. Dunham is executive producer, writer director, actress of the critically acclaimed HBO series “Girls,” as well as a best-selling author and cofounder of the newsletter, Lenny (LennyLetter.com). She has been nominated for eight Emmy Awards and has won two Golden Globes, including Best Actress for her work on the show. Waxman, film and theater producer Paula Wagner, A+E Networks president and CEO Nancy Dubuc and The Girl’s Lounge Founder Shelley Zalis hosted the breakfast. TheWrap hosts breakfasts in Los Angeles, New York, San Francisco and Washington D.C. Previous speakers at TheWrap’s Power Women breakfast series have included Academy Award-winning actress Helen Mirren, comedian Chelsea Handler, “Game of Thrones” actress Emilia Clarke, activist-actress Selma Hayek, “Billions” star Malin Akerman, producer and entrepreneur Gail Berman, California Attorney General Kamala Harris, Minnesota Sen. Amy Klobuchar, New York Times columnist Maureen Dowd, media executive Nancy Tellem, digital executive Susan Lyne, technology journalist Kara Swisher and many others. Malin Akerman and Poppy Crum were among the many inspiring females sharing stories with TheWrap's CEO and Founder Sharon Waxman. "Billions" star Malin Akerman arrives at TheWrap's Power Women Breakfast in San Francisco on May 11. Lisa Stone (Entrepreneur in Residence, Trinity Ventures), Poppy Crum, Sharon Waxman, Malin Akerman, Krista Anderson (Chief Costumer Officer, OKTA), Jade McQueen (Managing Director of Media and Entertainment at Box) and Courtnee Westendorf (SVP & CMO, The Oakland Raiders) arrive at TheWrap's Power Women Breakfast on May 11. The crowd at TheWrap's Power Women Breakfast in San Francisco on May 11. TheWrap's CEO and Founder Sharon Waxman speaks to "Billions" star Malin Akerman at TheWrap's Power Women Breakfast in San Francisco on May 11. TheWrap's CEO and Founder Sharon Waxman speaks to head scientist at Dolby Laboratories Poppy Crum at TheWrap's Power Women Breakfast in San Francisco on May 11. "Billions" star Malin Akerman listens to a panel at TheWrap's Power Women Breakfast in San Francisco on May 11. Sharon Waxman introduces Courtnee Westendorf, Jennifer Jolly, Krista Anderson, Jade McQueen and Lisa Stone. Sharon Waxman speaking to Courtnee Westendorf, Jennifer Jolly, Krista Anderson, Jade McQueen and Lisa Stone at TheWrap's Power Women Breakfast. The crowd at TheWrap's Power Women Breakfast on May 11. 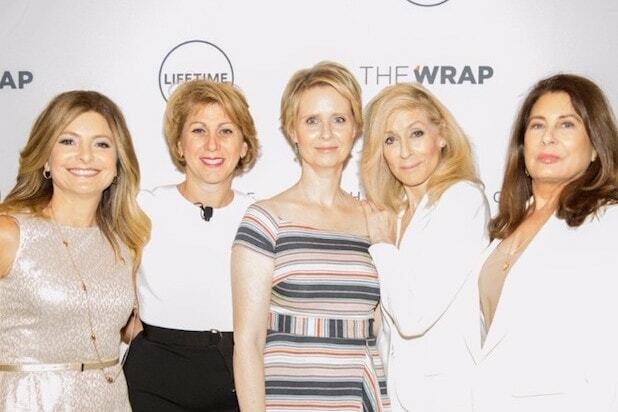 The table at TheWrap's Power Women Breakfast on May 11. Poppy Crum during her panel with Sharon Waxman at TheWrap's Power Women Breakfast in San Francisco. Malin Akerman speaks with Sharon Waxman during a panel at TheWrap's Power Women Breakfast. An issue of OscarWrap on the table at the Power Women Breakfast on May 11. Malin Akerman at TheWrap's Power Women Breakfast. Senior Director at Apple Karen Appleton greeting another attendee at TheWrap's Power Women Breakfast on May 11. Malin Akerman and her sister Mikaela Akerman taking a picture at TheWrap's Power Women Breakfast on May 11. Alexandria Duvaras, Jennifer Newhart, Malin Akerman, Liz Krukowski and Jennifer Bowcock attend TheWrap's Power Women Breakfast. Sharon Waxman and Malin Akerman at TheWrap's Power Women Breakfast on May 11. Women mingling at TheWrap's Power Women Breakfast on May 11. Jennifer Jolly, Krista Anderson, Jade McQueen and Lisa Stone at TheWrap's Power Women Breakfast. Those who donated to the charity auction were Dolby, Women’s Audio Mission, The Oakland Raiders, Joel Bernstein, Surf Air and Skin Fitness Ocean Treatment. Mikaela Akerman at TheWrap's Power Women Breakfast in San Francisco. Sharon Waxman and Poppy Crum lead a panel at the Power Women Breakfast on May 11. Sharon Waxman talks to Poppy Crum at the Power Women Breakfast.